Instagram is a marketer’s haven. It is easy to find a market niche through Instagram’s features such as the hashtags and the “follow” feature. You can take advantage of your Instagram account’s on followers by converting your personal Instagram into a business account. This article will guide you how to switch to an Instagram business account. Social media platforms are now being used by many businesses. Whether you are from a small enterprise or a big company, Instagram’s market reach, when used effectively, can boost your sales. Instagram offers a wide range of targeted market which has a high possibility of converting into sales. This is the reason why businessmen choose to post and promote their products on social media platforms such as the Instagram. 1. Launch your Instagram app. If you are not automatically logged into your account, sign in first. 2. Tap your profile picture in the bottom right corner of your screen. This will open your personal Instagram account. 3. Click the Settings icon. It is the cog wheel beside the Edit Profile button. 4. Scroll down then tap the Switch to Business Profile option. 5. A welcome message will appear. Click the Continue tab that’s highlighted in blue on the lower part of your screen. 6. There are three more screens that you need to go through. Just tap the Continue button. 7. After the four-page introduction, the Connect to Facebook screen will appear. Tap the Choose page tab. 8. Check which Facebook page you want to connect to your Instagram account. Also, this is going to be your Instagram Business Profile. 9. Tap the Next button located in the upper-right corner of your screen. 10. 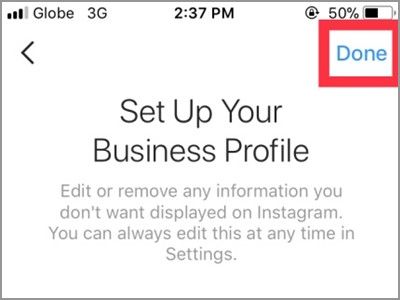 Instagram will extract data from your Facebook page to your Instagram account. You have to edit your information carefully should you place them on your Business profile. You can choose not to show your email address or your mailing address. Now, edit your page information. 11. To continue switching your account, it must be turned into Public account. Toggle off the button for Private Account. 12. Tap OK to confirm. 13. Finally, tap the Done button. After all of that, Instagram will welcome you to your new Business profile. Q: What is the difference between the personal account and the business profile? A: There are lots of differences. First, it has the useful options which are the contact and the promote. The contact option will help your prospective buyer to reach you easily. With your provided contact information it makes it easy for them to communicate with you. While with the promote button, you can create an ad effectively. It will work well with the data provided by the insights tool. This is the most important area of the business account. It is the graph like icon beside the settings icon. It gives the business owner the whole information about the status of the product he posted. Like how many engagements and impressions. What is the gender and age of those who reach it? Also, it gives you what time of the day they’re using the Instagram. Sounds interesting right? Q: I can’t link my page to my Instagram account. A: Only the admin of a Facebook page has allowed connecting to Instagram Business Profile. Make sure that you are the admin of the page. If not, contact your page admin. Q: I don’t have a Facebook page but my Facebook account is like my business profile. Can I still link it to my Instagram? A: On our personal experience, we’ve tried to connect one Facebook personal account to Instagram. The Facebook account doesn’t have any pages created with it and to our surprise, both accounts linked! However, make sure that the two social media accounts are bearing the same name. There you have it. Your business might grow with this Instagram feature. Give it a try. Besides, if you don’t find it productive, switch to the personal account anytime. You just learned how to switch your personal Instagram into a business account. We hoped that this move would further increase your market reach and sales. If you have questions about any of the steps above, let us know in the comments section.